In medium bowl, toss beef with sesame oil, salt and pepper. Spray 6-quart Instant Pot™ insert with cooking spray. Select SAUTE; adjust to normal. Add vegetable oil to insert. Add beef in 2 batches; cook 2 to 4 minutes on first side until browned. Turn; cook 2 to 4 minutes longer on second side or until browned. Select CANCEL. Add broth, orange juice, soy sauce, brown sugar, garlic, gingerroot and browned beef to insert. Add apple on top of beef. Secure lid; set pressure valve to SEALING. Select MANUAL; cook on high pressure 45 minutes. Select CANCEL. Set pressure valve to VENTING to quick-release pressure. Shred beef, and toss with 1/2 cup of the cooking liquid. Discard any remaining cooking liquid. Meanwhile, in medium bowl, mix mayonnaise, lime juice and Sriracha sauce. Add cabbage and green onions; toss with tongs to blend. 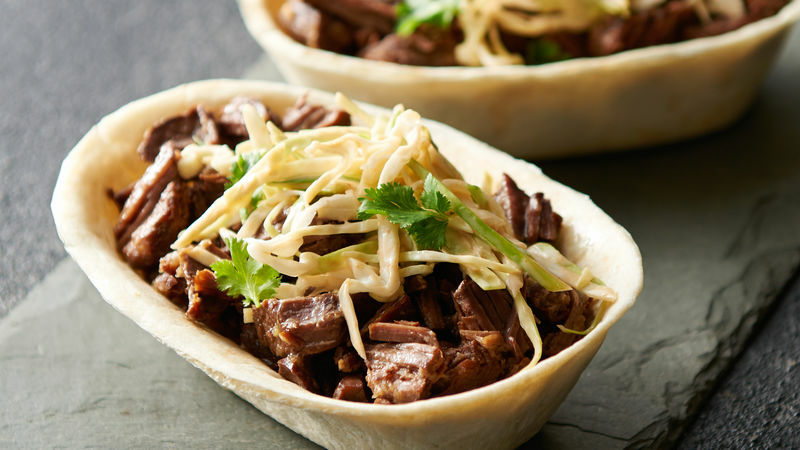 To serve, divide beef among tortillas, leaving any remaining liquid in bowl; top with Sriracha slaw. Garnish with cilantro. You can substitute 2 lb beef chuck roast for the sirloin. A Granny Smith apple is a great choice for this recipe.